On the Badagry Expressway, the wide highway leading west from Lagos, bus stops are distant. With congestion added to geography, the in-between moments can stretch. As in most public space in this vast city, vague vacancy is capitalised upon. I have an 8-minute recording of a vendor who entered one danfo bus. He alternates accents; he flirts with the audience; there is a stand up routine. It’s a monologue, it’s theatre, he concocts a whole world and passengers are stuck to witness it because they are sitting in traffic and his presence echoes, filling every crevice of the metal belly of the van. Once the whole bus is engaged, he starts explaining the wonderful cure-all properties of the drug he is pushing. It heals everything from a cold to a parasite and only costs 50-naira. On the street where I live, a rutted dirt road saturated with sanctuaries (two churches, a shrine and a mosque are all on the block), street-side preachers join the cacophony. They park and proclaim for hours through blaring loudspeakers: narrating, orating, vending hope and salvation. Meanwhile in the market, every so often, an imposing figure shrouded from head to toe in lush, layered fabric approaches pedestrians to pray and demand money. The Egungun masquerades represent ancestral spirits present in the space. During festivals they infiltrate the city, sending kids running to clear their paths. I see performance everywhere in Lagos. It is part of tradition, part of religion, part of social interaction, part of commerce. Fashion plays its part too. It is the costume we wear in daily life to define ourselves, and the character we present in the public sphere. I am constantly arrested by Lagosians’ meticulous style. People don entirely different personas through clothing: for work, home, church, clubbing, weddings. The expression is both diverse and socially stratified. What one wears is indicative of class, taste, age and purpose. You can read Lagos on this surface, mesmerised by the kaleidoscope, or you can dig and find the layers, the structures, the meanings to everything. In a place pressed with so much humanity - by nature of its density if nothing else - that underlying complexity is both striking and disturbing. 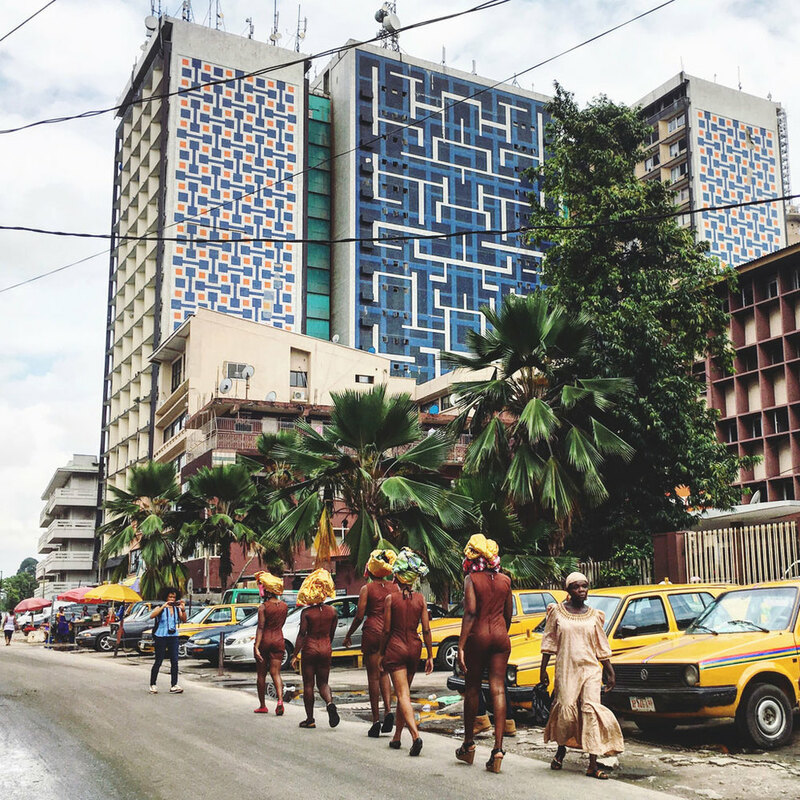 Five women dressed in brown body suits, reflective masks and golden headdresses that transmuted into a cape, took a brief, fast paced strut through Lagos Island. They paused at certain junctures to change clothes or just to vogue, their bright luminosity framed by the boxy, independence-era modernist architecture of the neighbourhood. Ogunji designed the costumes to be otherworldly and to have no practical use. The essential aim was beauty. “When I think about performance and especially this piece Strut, it’s really about that sense of free presence… there’s nothing I need to do to have value in the world, it’s just enough to be here,” she says. But, like everything, the work is layered with meaning. It is ultimately about women and power, the body and liberty. Women strutting boldly, taking up space and attention and looking like mythical creatures is a reversal of their normal roles. “Through life I feel like I have been inundated with a lot of stuff: ‘be small, be quiet, stay dainty’ and now I’m pretty familiar that that’s just generally in the global lexicon of how women should behave,” says Tito Aderemi-Ibitola, one of the performers. 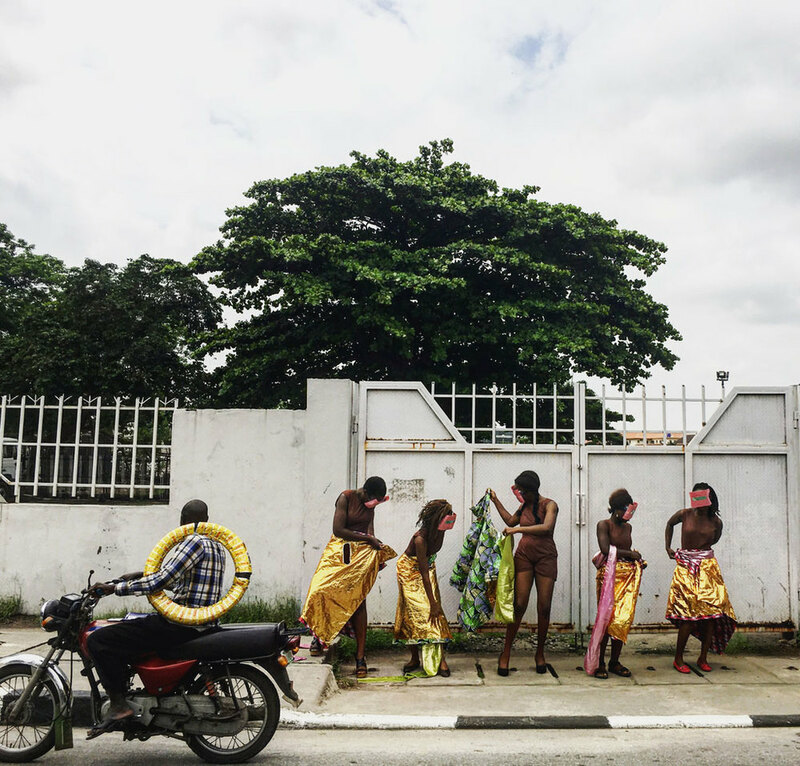 Aderemi-Ibitola is also a Lagos-based artist, she works primarily with performance and video on the intersections of race, gender and ethnicity. 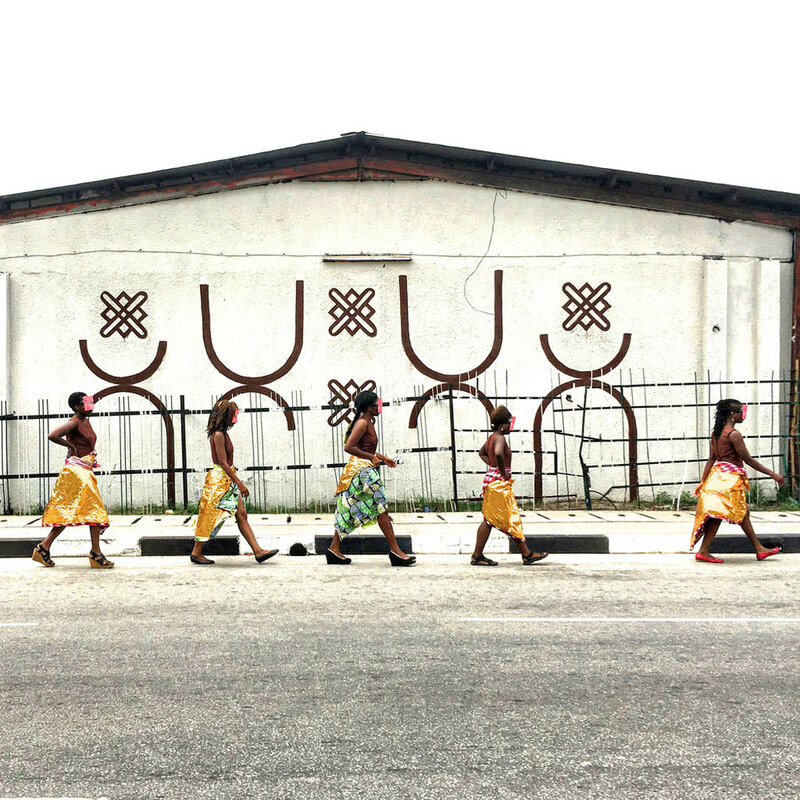 Ogunji invited artists and women she knew to take part in Strut. It was the first time putting on a performance without participating herself. Strut is a further response to this. It involves action, but it is not particularly taxing. It engages with gender in the public sphere, but this time instead of elevating women’s burden, it disrupts it. There is force in ritual action: it is one thing to imagine a different reality, but something completely different to perform feminine power in the world. “If I say I want women to have this feeling of freedom, the only way that can happen is through something creative, through the thirty minutes that they had on the street,” Ogunji says. Strut will also travel, it is included in the upcoming Africa Forecast: Fashioning Contemporary Life exhibition at The Spelman College Museum of Fine Art in Atlanta this September. It will be re-performed in Lagos and perhaps also in Johannesburg and Luanda. In each place there will be local performers, local architecture, and perhaps local fabric, ways to adapt it to the context. “It’s almost like a rip in the time-space continuum,” Aderemi-Ibitola says of the performance. For the women who took part, women who exist in the harsh, at times degrading complexity of Lagos, Strut was a half-hour apart, a time to just be magic.